It is possible that some of the BMS functions may be performed outside of the traction pack as well. The BMU is enclosed in an aluminum case, mounted against the end of the stack of 24modules, in a corner of the battery pack. 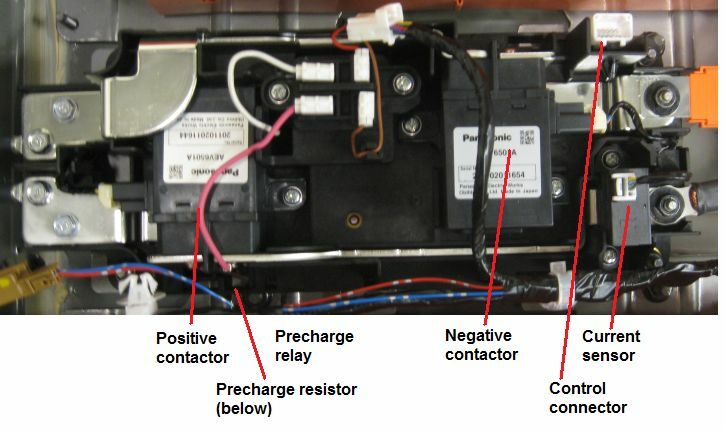 There are 4 high voltage connectors along along edge, for connection to cell voltage sense taps wires. The BMS uses a 2-sided PCB, with SMD components on both sides. The PCB has 6 right angle, automotive grade connectors. The circuit includes a controller, based on a NEC / Renesas uPD70F3236 processor (see below). The circuit is powered from the vehicle’s 12 V supply, which feeds 2 linear regulators, based on the Toshiba TA58LT00F adjustable LDO regulator ICs. There are 5 digital isolator and a relay to isolate the battery side (high voltage) from the control side (low voltage). There is also a digital isolator between the ICs that monitor modules that are on one side of the safety disconnect and the other side.When the safety disconnect is removed while the vehicle is on, the entire pack voltage appears across the safety disconnect (in the opposite polarity). That voltage normally would blow up the BMU. By splitting the BMU sensing into 2 sections isolated from each other, the BMU is not damaged. There is a detector of loss of battery isolation, which works by applying a slow sine wave (~ 1 Hz) between the low voltage ground and the high voltage battery, AC coupled through 3 series electrolytic capacitors (3 capacitors instead of 1 for reliability). A loss of isolation results in a phase shift in the current through the capacitors with respect to the applied voltage. The controller detects that phase shift and reports a loss of isolation. 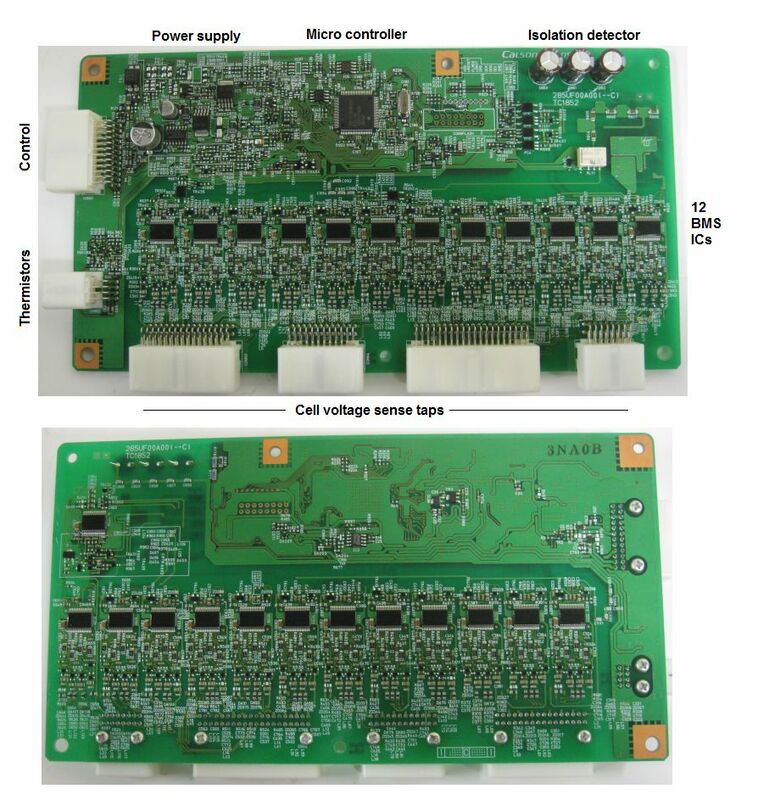 The circuit uses D15110 ICs from NEC / Renesas: 4-cell Li-ion BMS analog front end. This IC is not published: it is presumably only available to large BMS manufacturers. Cascading uses a single wire; communication start from the controller, to the IC at positive end of the string, and progress down the string of cascaded ICs, then from the IC at the negative end of the string back to the controller. This one-wire link uses an external transistor as a current source to level shift the signal from one IC to the next one. Has 5 address inputs, to assign an ID of 0 ~ 63 to each IC on the board, by grounding some of these inputs through the PCB. The controller tells a given IC (based on its ID) which balance outputs to turn on, and receives from each given IC 4 readings of its cell voltages. 98 terminals to battery modules.